Let guests know what will happen next in your service. Letting guests know what to expect is a courtesy you can extend by including an order of service, a wedding ceremony agenda that lists what will occur. Whether you are having a Christian, Irish, Celtic or Native American wedding ceremony - or some other type of service, you will have to pick and choose what options you want to include. 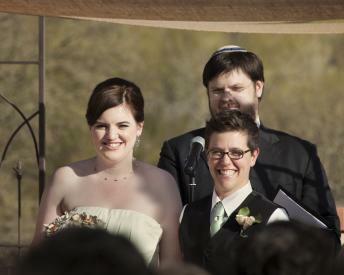 The number of readings, musical selections, and any rituals you want to include will be up to you and your officiant. The kinds of rituals and options you end up doing will depend on any religious affiliation you might have, cultural preferences and the recommendations of your civil leader or religious guide. You might want to take into consideration traditions that have been followed in family weddings, like using particular songs or prayers. Processional: The bridal party marches down the aisle. Bridal March: The entrance of the bride to the ceremony service site. Welcome/Introduction: The officiant welcomes guests, bridal party and couple. Exchange of Vows: The couple commits to one another; personal wedding vows can often be used. Exchange of Rings: A common ritual in weddings in the U.S. and other countries. Pronouncement: The officiant declares the couple married; the couple may kiss. Recessional: The couple and bridal party exits to a musical selection. The outline above provides a basic structure for many ceremonies performed in the U.S. today. Optional items are usually scattered throughout the basic order listed. Prelude: Optional: Musical selections played while guests are being seated. Reading: Optional: A short love poem or sonnet can be read. Musical Selection: Optional: A soloist can sing the couple's favorite love song. Rose Ceremony: Optional: The couple may choose to honor their parents or children by exchanging roses and then presenting them to the family member(s). In a civil service, you will have a good amount of leeway when it comes to placement of optional rituals and rites beyond the basic requirements. Keep in mind that you will want to let your officiant know any changes before the wedding rehearsal, so it can be practiced in the correct order. A religious service will often follow a prescribed formula set out by the particular religion. Whether you are Buddhist, Catholic or Christian, your religion will end up dictating a large majority of your wedding order of service. Prelude: Optional: Religious music played before the service beings. Prayer: Optional: A prayer is said by the religious leader. Declaration of Intention by Couple: Optional: The couple reads a statement about their religious beliefs and intent to marry. Declaration of Support: Optional: Parents and/or guests in attendance may be asked to affirm their approval of the marriage and make a statement to support the couple's marriage and faith efforts. Musical Selection: Optional: A religious selection is sung or played. Scripture Reading: Optional: The religious leader or honored guest reads a selection from a religious text. Sermon/Address: Optional: The leader will give a short sermon regarding love, marriage and faith. Musical Selection: Optional: A religious song is sung or played. The congregation may be asked to participate. Lighting of the Unity Candle: Optional: The couple lights a candle to represent their marriage. Sometimes this is done during a musical selection. Blessing: Optional: The officiant will bless the couple and guests. Communicate with your religious officiant what additional things you want to include in your wedding service. Some religions may ban particular practices or encourage others, so your leader is the best resource for finding out the proper order of service. Your church or religious secretary may have wedding program samples from previous ceremonies for you to use as a guide. Regardless of the kind of service you have, you will want to let your guests know what will happen during the ceremony. Have ushers hand out wedding programs to guests as they are shown to their seats. Include the references for any readings that are done, whether they are from a poet or from a religious text. You should also include the names of love songs used within the service, such as the bridal march, solo(s) and recessional. Any special guest readers or musical performers should be listed by name in the ceremony's program order of service.